Make good on your New Year’s resolutions and stay festive with this cozy cocktail. 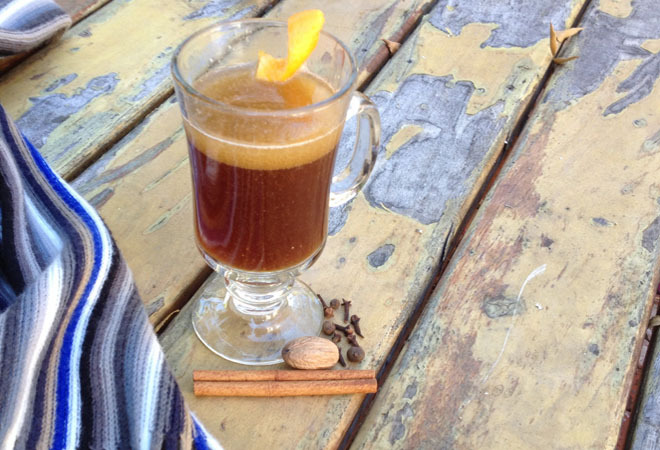 If you’re already looking to mind your New Year’s Resolution of a meat-free 2014, here’s a vegan hot buttered rum recipe by bartender Jeremy Lake of Crossroads, Chef Tal Ronnen’s white tableclothed vegan restaurant. 1. Heat up to slowly melt butter and add simple syrup and spices. 2. Add in the rums and hard cider. 3. Pour into a heat-resistant glass. If you’re not a DIYer, not to worry. You can cozy up to the guilt-free hot cocktail at the Melrose restaurant where it’s available off menu. For other animal-free cocktails swing by Mohawk Bend and indulge in the “Egg Not,” its eggless eggnog which this year trades the soy milk for a richer coconut cream. Or try bar chef Matthew Biancaniello’s “Harvey Walberry” at Feed Body & Soul in Venice, only available on Wednesdays and Saturdays and made with fresh raspberries, pomegranate juice, dill, ginger, and homemade foraged walnut liqueur. Even though Santa Monica raw food restaurant M.A.K.E. is strictly beer and wine, it serves up an uber healthy-sounding “Kale Cooler” — kale, cucumber, pear, lime, and white wine — which “was designed with the refreshing flavor of a traditional ‘green juice’ in mind,” said M.A.K.E. Creative Director Meredith Baird.